Living on our planet for millions of years, this creature has perfected survival in our oceans. With the amount of knowledge we know about Great Whites, Peter Benchley the author of JAWS, cannot make JAWS not in this formal reason. He regrets making it because people think that sharks must die but they shouldn’t, humans hate sharks just because they KILL someone, that’s because they don’t know what they are. The Great White takes a bite then leaves. If you see someone surfing and they get attacked that’s because from the bottom of the board they look like seals, which is their main food. If there is a Great White shark right in front of you and you think it is going to eat you it won’t, it has a FREEZING smile to get water through its mouth so it can breathe that way. The water goes through their mouth and out their gills. A lot of humans cut off their fins for the infamous fin soup, after they cut their fins off they throw them back in the water and they sit there and die sense they cannot swim. 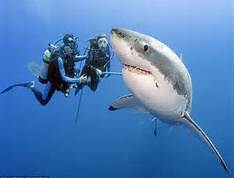 A great white has 6 senses. They are smell, hearing, touch, taste, sight and electro magnetism! They could hear a pack of seals 2 miles away from where they are. There are over almost 500 sharks in the entire World. Many people are finding more sharks by each year. You can find 20 sharks that we know of those that ATTACK humans. The Great White doesn’t. People think that the Whites go into feeding frenzies, they don’t they are calm sharks. This is my son’s study on Great Whites and what he believes from the information he read and heard. When I asked him about this, he was very passionate and was really interested in it. I don’t know if this is all true or just his understanding of the information. I found it interesting. I see his writing is getting better every year. I see some errors, but I think in time they will improve. This entry was posted in Family and tagged freezing, great white, jaws, oceans, planet, sharks, Writing. Bookmark the permalink.